Spiced macaroons with a pistachio cream. Delicious French delicacies - macaroons with a homemade fresh apricot and lavender filling. A fun twist on the classic raspberry ripple dessert - delicate French macaroons with rippled shells and a raspberry jam and creme patissiere filling. 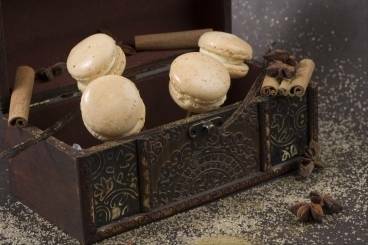 Perfectly cooked macaroon biscuits filled with a rum flavoured buttercream. Lovely yellow macaroons sandwiched together with a cayenne spiced pineapple filling. An original take on a favourite sweet treat.